Between May and July 1945, the Allies launched a three-pronged attack on Borneo, first at Tarakan and then six weeks later at Brunei Bay. These landings were conducted by the 9th Australian Division, which had served at Tobruk and El Alamein in 1941 and 1942 and in New Guinea in 1943. Tarakan was to be captured in three weeks but Japanese held on for two months. There were nearly 900 Australian casualties, including 225 killed. 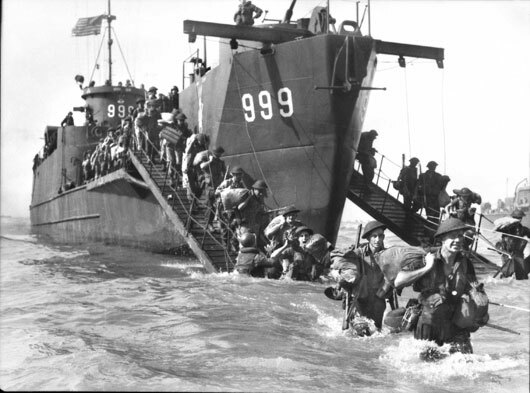 Thirty thousands Australians took part in landings at Brunei Bay on 10 and 16 June 1945. The town and airfield of Labuan were captured on the first day but strong Japanese resistance on the island continued until 21 June. In the meantime the Australians were advancing in North Borneo and in Brunei and into Sarawak. There were about 350 Australian casualties, including 114 killed in the campaign. The third Borneo operation was a major combined land air and sea operation at Balikpapan on 1 July, the largest ever amphibious assault involving Australian forces. The troops for Balikpapan were the 7th Divisions, veterans of the Middle East and New Guinea. Balikpapan was one of the world’s richest oil centres and a major supplier of oil to the Japanese war machine. The Japanese had been pushed out off the coast area by 9 July and three weeks after the landing abandoned their positions and withdrew to the rugged hills of the island. Of the 850 Australian casualties, 229 men were killed. Men of the 2/14 Infantry Battalion wade ashore at Yellow Beach during the Oboe 2 operation (AWM 110436). 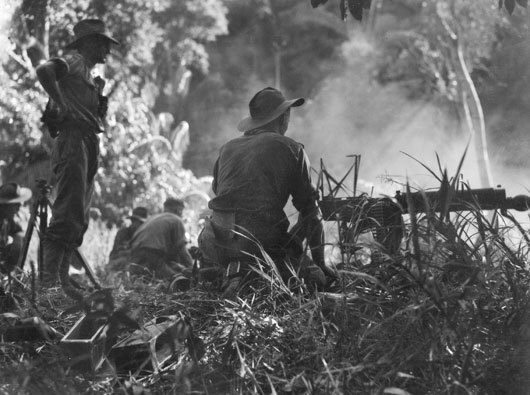 Members of the 2/2 Machine Gun Battalion firing on a native village housing 200 Japanese soldiers (AWM 109534). 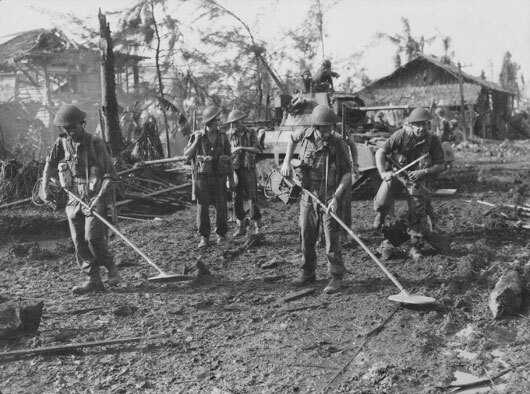 Australian soldiers searching for mines shortly after landing at Balikpapan (AWM 110379). 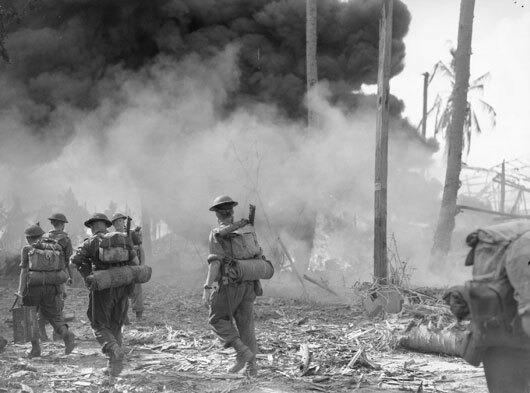 Troops move along Vasey Highway during the Oboe 2 operation, as oil fires blaze in the background (AWM 110383). 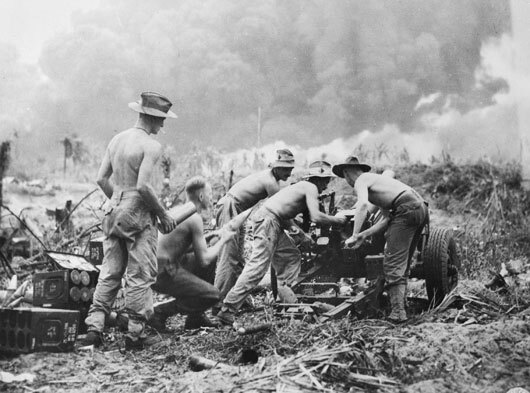 Artillerymen pounding Japanese positions 6000 yards away following the landing at Balikpapan (AWM019437). 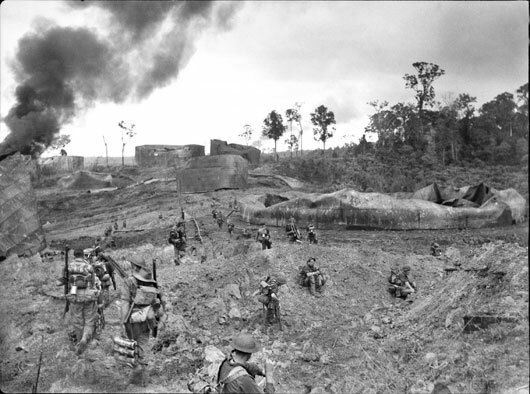 A Company, 2/23 Infantry Battalion, advancing through wrecked oil storage tanks at Tank Hill, Tarakan (AWM 090932).